Pistorius Pleads Not Guilty, Witness Tells Of Hearing Screams : The Two-Way The murder trial of the South African sprinter known as the "Blade Runner" has begun. He's accused of killing his girlfriend. Oscar Pistorius say she mistook her for an intruder. 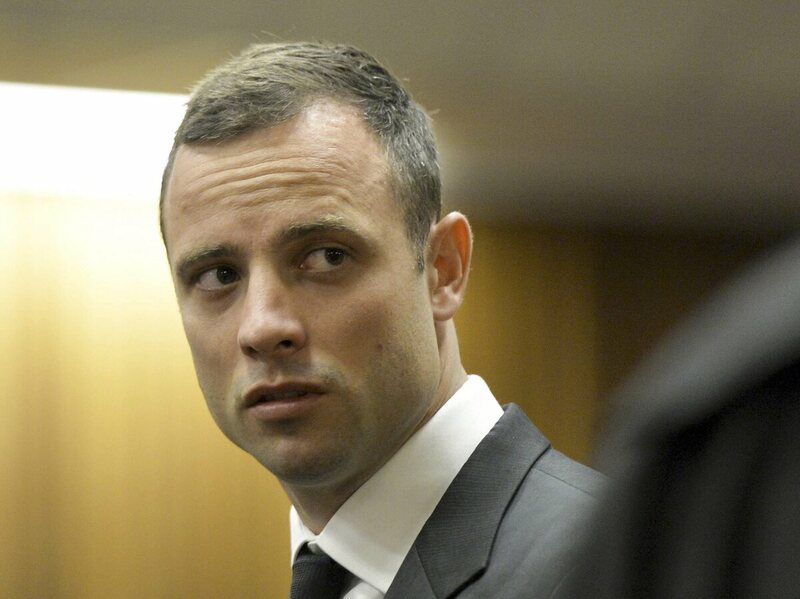 Accused South African Paralympic athlete Oscar Pistorius in court on Monday in Pretoria. He's accused of premeditated murder in the death of his girlfriend on Feb. 14, 2013. "The first witness at Oscar Pistorius' murder trial told the court on Monday she heard 'bloodcurdling screams' from a woman followed by shots," Reuters writes. It was, the wire service adds, "a dramatic opening to a case that could see one of global sports' most admired role models jailed for life." "Pistorius was a hero to many in and outside South Africa. He earned the 'Blade Runner' nickname, because of the high-tech carbon fiber blades he used to power to victory as a paralympian. "But that image crumpled when Pistorius was accused of premeditated murder in the shooting death of his girlfriend, Reeva Steenkamp, on Valentine's Day last year. He says it was a tragic accident and that he mistook the 31 year-old model and law graduate for an intruder." Pistorius, 27, officially entered a not guilty plea to the murder charge Monday at the start of the trial. He also pleaded not guilty to three firearms charges. Then, as Agence France-Presse reports in its live blogging of the proceedings, the first witness was called to the stand. She's Michelle Burger, a neighbor of Pistorius' in an upscale, gated section of Pretoria. "I heard petrified screaming before the gun shots, and just after the gun shots," she told the court, according to AFP. Burger said she heard a man shouting but noted it was a woman's voice that sounded particularly scared. "Thinking it was a violent break-in — a possibility in crime-ridden South Africa — Burger said her husband called the private security firm guarding their upmarket housing estate in Pretoria's eastern suburbs, before the pair heard more shouts.
" 'It was very traumatic for me. You could hear that it was bloodcurdling screams.' Throughout her testimony, the 27-year-old Pistorius sat impassively, staring at the floor." The trial is expected to last at least three weeks. It has drawn comparisons, not surprisingly, to the 1995 trial of football star O.J. Simpson for the murder of his ex-wife and a friend of hers. Simpson was found not guilty. The Pistorius trial is such big news in South Africa that a cable network is devoting an entire "pop-up" channel just to 24/7 coverage of it.